Earlier tonight, Tower 21 and Squad 22 responded to the intersection of Kinderkamack Road and Church Street to investigate a reported odor of natural gas. Companies were dispatched to a garage fire in the 300 block of Oradell Avenue. 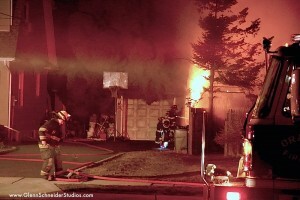 Upon arrival, crews were met with heavy smoke from a detached 2 car garage. Squad 22’s crew made entry from a side door and located the fire in a separate rear room and knocked down the fire. Assistance was provided by Paramus Ladder 1 FAST, New Milford Fire, River Edge Fire and New Milford Ambulance. We are the nearly 60 dedicated men and women volunteering to protect the Borough of Oradell, every hour of every day. We have been providing fire and rescue services since 1897 to the borough, protecting residents, business, and visitors. On behalf of the Officers and Members of the Oradell Volunteer Fire Department, thank you for visiting our website and for your continued support.